Dates are a Middle Eastern fruit with a heritage and history as rich as their benefits. The fruit has been linked to diets as far back as the 5th century when the Egyptians consumed them for their sweetness and their nutritional value. Dates, which have a higher caloric value than other fruits, were used to stave off hunger and provide the body with important nutrients. Besides, dates have amazing therapeutic values. Dates are delicious foods which have a variety of nutrients, including Vitamin A, fiber, iron, potassium, magnesium, calcium, and manganese. Because of this array of essentials, dates are beneficial health foods. Because the body needs a certain amount of carbohydrates to function properly, one good source comes from dates. The simple sugars of dates are easily digested and processed by the body, making them more beneficial than corn syrup or processed sugars. Dates are high in fiber, including soluble and insoluble fiber, which helps the body to feel full and satiated, making dates as an appetite suppressant. Dates also helps to regulate the bowels, clean the colon of harmful toxins. Another dates nutrition is tannin. The tannin compounds that are in dark fruits and other foods, like dates, have an astringent effect on the mouth and breakdown proteins. Experts claim that tannins have many beneficial effects for the body, giving a cleansing property to the bowel. Dates have many antioxidant flavonoids that protect the bowel from free radicals and toxins. Eating dates gives you that extra defense against harmful environmental products. The antioxidant flavonoids of lutein and zea-xanthin are housed in dates as well, which help negate the damaging impact of oxygen-free radicals in the body, protect against prostate, endometrial, pancreatic, lung and colon cancers and fight against macular degeneration, age induced eye conditions. Dates contain vitamin A in small amounts, which helps facilitate vision and aid the lungs and oral cavities in combating cancer. Dates contain B-complex group and vitamin K, which help the body metabolize carbohydrates, proteins, and fats. Vitamin K also serves as a blood coagulant that helps with bone metabolism. 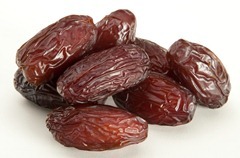 Dates nutrition includes many minerals such as iron, manganese, copper, magnesium and calcium. Dates absorb calcium into the body which helps facilitate bone growth and strengthening, as does the magnesium. Manganese, in turn, helps antioxidant enzymatic processes. Potassium helps reduce blood pressure and healthily control heart rates, preventing stroke and heart disease. Apart from the many dates nutritions which are of great help for human body, dates can also be helpful for relieving and treating many disorders. Dates improve healthy bowel activity. This, though, can be a double-edged sword as they may also act as a laxative as well. If you want to use the dates as a laxative, soak them in water for a full night before you consume them. Dates are high in nicotinic content, which is important for healing and helping to combat intestinal conditions. Bacteria and organisms can grow in the intestines, and dates can be used as a way to stop them. Dates have many nutritional values, which is great for the body, especially for those who are over-slimming. Dates are high in calories and must be eaten sparingly in order to gain the nutrition and benefits without causing weight gain. Dates can be useful in combating heart problems. It is best to enhance these heart helpful properties by soaking them in water for an evening and then consuming them in the morning, in a crushed form. Drink this twice a week. Sexual stamina is essential and necessary for a healthy intimate life. Dates soaked with goat’s milk for an evening and combined with cardamom powder and honey can increase sexual endurance. Dates contain the nutrient potassium, which is crucial for the control of diarrhea. If suffering from this bowel disorder, eat a small amount of dates to help with the problem and create a soothing effect. By soaking and rubbing dates overnight in water, the nutritional value and benefits are increased. Andeating soaked dates alleviates intoxication and the after effects. Abdominal cancer is a serious problem of the body that impacts all age groups. Dates can be easily digested and help to combat against abdominal cancer growth. They help with healthy intestinal and abdominal activity.